Manchester Thunder's Helen Housby is aiming for a place at the Commonwealth Games after her last-minute winner clinched the Superleague title. 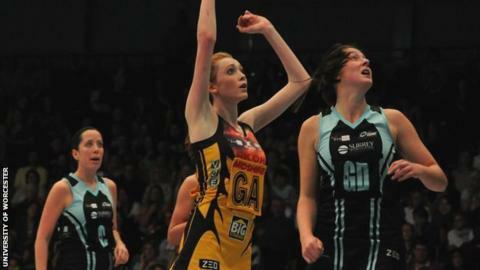 The 19-year-old student threw the winning shot with just seconds left as Manchester beat Surrey Storm 49-48. Housby received her first England call-up this month and will tour Australia with the national team in May. And the goal shooter is hoping for some good performances to put her in the frame for Glasgow. "I can't believe it, it was the longest five seconds of my life," said Housby from Cumbria. "I was waiting for Sara [Bayman] to pass it to me and I was like 'I'm ready, I will just do it'. "We practice long shots in training but you never know what will happen in that situation. "I'm hopeful I will get in the Commonwealth team but I am not trying to rest everything on it. "It would be great if i could get in the squad but I want to focus on the Australian tour first and put in some good performances." Housby is hoping to pair her university studies in zoology with being a professional netball player. She added: "I would like to do both and be a professional. I get an opportunity to go abroad in my third year at university and I am looking at perhaps playing in the ANZ Championship in Australia and New Zealand."